Washington: US President Donald Trump said Wednesday that he expected Daesh to lose all remaining territory in Syria in a week as he pledged to stay focused on fighting the extremists. Trump spoke to an international conference in Washington on the future of the battle against the group after the US leader’s sudden decision in December to order the pullout of all 2,000 US troops as he declared victory. 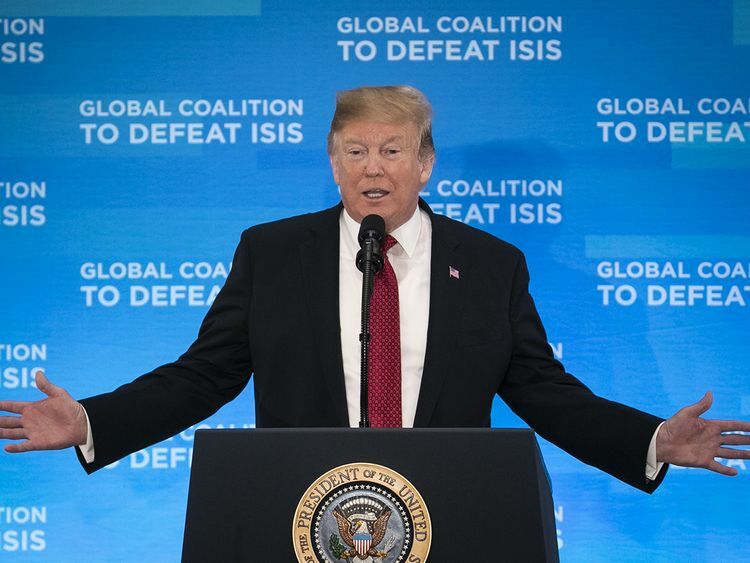 “The United States military, our coalition partners and the Syrian Democratic Forces have liberated virtually all of the territory previously held by [Daesh] in Syria and Iraq,” Trump told senior officials from more than 70 countries meeting at the State Department. “It should be formally announced sometime next week that we will have 100 per cent of the caliphate,” he said. Trump said that the United States would remain “very, very tough” and encouraged efforts, including financial support, from other countries. “Remnants — that’s all they have, remnants — but remnants can be very dangerous,” he said. “Rest assured, we’ll do what it takes to defeat every ounce and every last person within the [Daesh] madness and defend our people,” he said.